I am new to posting to this forum although reading it has helped a lot. My teen son is raising racing pigeons (and I am getting hooked too ;-) ). A few weeks ago, one of his pigeons came home after being attacked by a predator, probably a hawk. He had punctures through both wings, punctures on each side of his body, and his eye appeared to be missing. We cleaned out the wounds and applied antibiotic ointment and gave electrolytes. The next day it's eye area looked really bad and swollen but it's other wounds seemed to be doing ok and it seemed strong. The racing pigeon mentor really was hinting at putting the pigeon down but we felt it needed a chance to live since it had made it home and seemed to be doing ok except for the eye. So we did an internet search and we found this forum because of jimc2000's post about the pigeon he was helping with the missing eye that turned out to be a bad case of cankor. 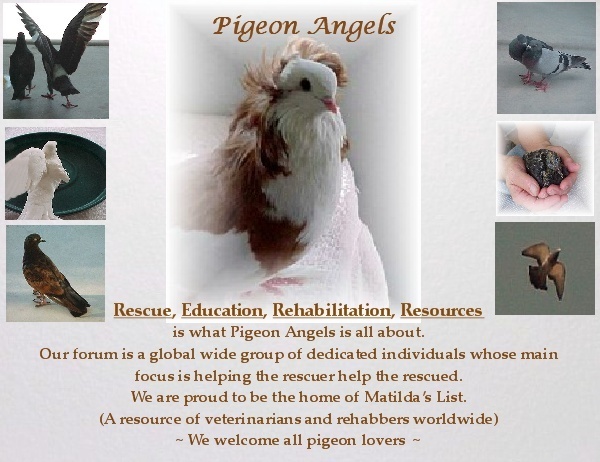 We used a lot of the information in the comments to determine a treatment plan for our pigeon. We gave the pigeon antibiotics (cipro), 4-in-1, herbal supplements (oregano oil, echinachea, probiotics) and washed its side wounds and eye out with diluted hydrogen peroxide. The eye area swelling went down, it weeped for a while but then stopped as we continued treating, it definitely looks to us as if the eye is totally missing though. His wings and sides healed up really well and about 10 days later, he seemed stronger and ready to go back out. We put him back out in the loft with the other pigeons and he seems content and is flying near the house now. We are still concerned about his eye area though. It now seems to have sunk in farther and is occasionally shiny as if it has been weeping again. Does anyone have experience with treating eye injuries and have a one eyed birds that is doing well that can give us some more direction? i have a pigeon that is blind in one eye so i would strongly suggest you dont let that pigeon fly free again, a hawk will notice if the pigeon doesnt look up at it from that side and will strike from the pijjies blind side. i use to let my pij fly around free but when i heard about so many cases where this happened, never again. i heard when they have missing eyes it will weep forever but idk if its true. GOOD LUCK! btw do you have any pictures? Hi mommietwolove............Welcome to Pij n Angels ......We're happy to have you here. I am happy to hear that your bird has survived the hawk attack. The Cipro you administered has saved him from infection from the puncture wounds and he should be allright from that standpoint. Regarding the misssing eye...........I have two birds with one missing eye. They are deemed unreleasable.........in the case of racing pigeons they would be called prisioner birds. This bird should be kept inside the loft and not allowed to free fly. A bird with vision in only one eye, now has a blind side. The bird's ability to safely fly has been comprised.........he can fly into buildings, wires ect. that he does not see on that side of his body and could be severly injured..........In addition, the most serious possisibility, is that he can not see a preditor coming for him from the blind side. This makes the bird a sitting duck for another attack. The weeping of eye is a normal consequence from the eye injury. It is nothing to be concerned with. Continue with the neosporin once a day, and make sure the eye area is kept clean. Eventually the eye socket will dry up and the weeping should lessen. Thank you for not putting this bird down. He should be able to live a full life with the other birds inside the loft. If you have an outdoor flight cage, he should be able to have plenty of excersise without being put in harms way. We would like to you and your son (and of course your pijjies) to Pigeon Angels. I am sorry to hear about your son's bird. Yes, Jim did a wonderful job of caring for his little rescue. Canker can be dreadful. I am so glad though that his posting of the incident helped you, help your pigeon. i have a pigeon that is blind in one eye so i would strongly suggest you dont let that pigeon fly free again, a hawk will notice if the pigeon doesnt look up at it from that side and will strike from the pijjies blind side. i use to let my pij fly around free but when i heard about so many cases where this happened, never again. i heard when they have missing eyes it will weep forever but idk if its true. GOOD LUCK! btw do you have any pictures? I totally agree with Ann Marie in that it would be best to not let the bird free fly for the reason stated. Welcome to Pigeon Angels. I'm glad you found us. I does sound like you bird was the survivor of a hawk strike and is lucky to be alive. Because of the eye loss, it's not a good idea to let the bird free fly anymore as he is very vulnerable to more than just hawks now. I had a one eyed bird that accidently got out of my loft and was out of reach to grab him and put him back inside. I watched in horror as a red tail grabbed him from his blind side a flew off. I would recommend that you find a vet that treats birds. What the vet may do, is remove what is left of the eye and then stitch it closed. We may have a vet near you in our list of resources. Hello & welcome to Pij n Angels You & your son definitely qualify as pigeon angels! Thank you for knowing the value of your pigeons life and not putting it down. We have about 30 pigeons who we live with and all of them have access to large flights, they get the excersise they need without the worry of an attacking hawk. I too strongly suggest only allowing your one eyed friend to only fly in a flight. I am sorry I didn't realize until today that the "watch this thread" feed was going into my junk mail so I didn't know people had replied. We have been so busy with sick or injured birds (chickens and pigeons oh my) that I didn't get a chance to find the thread again to check. I got some pictures of him and finally got them transferred to my computer too. My camera isn't the best as close ups :(. I hope they show up here ok the picture upload thing isn't intuitive to me. The white is the under lid and the lighting make it looks odd but it looks very clean and healthy up close. There is just a little weeping from the eye occasionally now. He is very happy to be back in the loft and isn't getting picked on. I know most here don't approve but we let him out daily and he flies laps around the yard about 2 times then he comes back to the loft roof and suns then goes inside; he seems very content with his life close to home. He doesn't even fly much more when it is a day we put the racers out just to fly around the house - if we don't remember to put him out first, he goes out with them but he stays close to the loft when they venture further afield. One thing we found interesting is that he now flies around the yard clockwise which is the opposite direction than the other birds normally go around the yard. We run on a tight budget due to people health issues so getting a vet right now isn't really feasible unless they did it pro-bono and so far with our chickens we haven't found that to be the case so I doubt it would be for pigeons either. If the weeping gets to become a problem then we'll see what we can work out - it is healthy looking now and maybe it is starting to dry up like Jackie"s Mom said. I was wondering what happened to you as I had noticed you on the forum severl times since your first post. I'm glad you figured out repies are going to you junk mail. Thank you for acknowledging how some of us feel about letting your bird free fly. The reason we feel that way is because letting him free fly is putting him at risk for another attack. He was very lucky to have survived the first one. The reason he stays close by is because his perception is off and he may be some what disorientated. I have a pigeon that is blind in one eye and he is very easy to catch by approaching him on the blind side. If I were a bird of prey, he's be long gone. Please don't fool yourself into thinking that just because he stays around the house he is safer. Also, I want any future reader of this thread to know that letting a bird with one eye fly free, is dangerous. By saying this, I want you to know that I'm beiong honest with you.and I don't want to alienate you by disagreeing with you. I'm very happy you have found our forum. The most improtant thing is that the birds have access to direct sunshine because that's how they get vitaminD, which is critical for processing calcium. I understand what you mean about the tight budget. At the least and for next time, TradeWinds in Tacoma may have antibiotic you can buy for a reasonable price. I don't know if you have a first aid kit on hand for your chickens and pigeons but I would recommend getting the basics put together so you are prepared, because believe me...something always happens when you need it. If push came to shove, I'm not that far away and I do have supplies. The eye does look better and I really do appreciate the update. We appreciate your update, mommietwolove. I'm glad your pij's eye is doing better. Please keep us posting on how things are coming along. Thank you for the pics. I'm glad he is doing better. Please just be careful about letting him out to fly. A hawk or other predator will notice his disability and single him out for an attack. He wouldn't have any defense if the predator came from the blind side. Thanks for the update. He's looking much better! I hope he continues to improve. It's a problem for most of us, trying to do our best for our pigeons on a tight budget -- it's never easy, and it usually means stopping them from breeding until conditions are better. I hope things improve for you, and you can manage to make your prisoner aviary soon, then your patient will have the best of both worlds: the freedom to fly, and being safe too.